The holiday season officially begins this week, and although it might be a tiny bit early for Christmas, I thought there's no time like the present to put up a gift guide, in case you're the type that likes to get your holiday shopping done early. Here are just a few suggestions if you're looking for any gift-giving inspiration: they're all things I find lovely this year, and I hope you will too! 1. 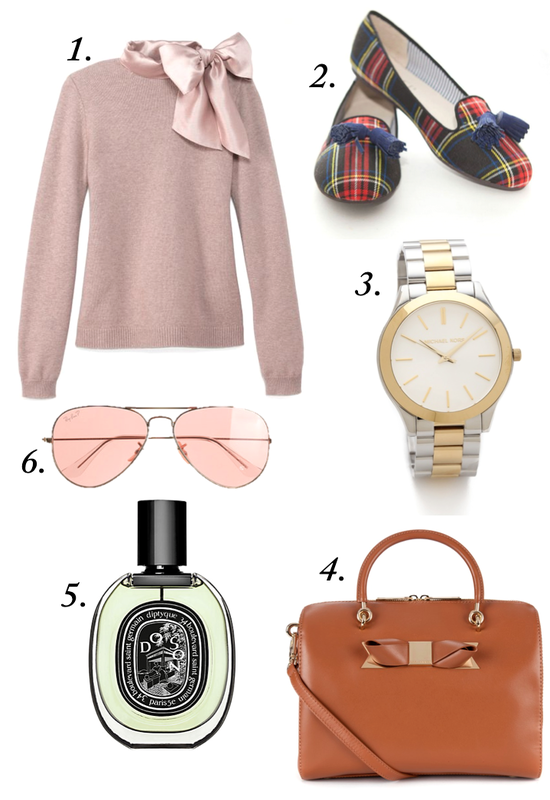 Tory Burch Sabine Sweater: The necktie is so elegant, and I am in love with the colour of this sweater! 2. Charles Philip Scottish Plaid Tassel Smoking Slippers: I love the silhouette of smoking slippers, and these shoes would be perfect for casual holiday parties. 3. Michael Kors Slim Runway Watch: You just can't go wrong with a classic mixed-metals watch. 4. Ted Baker Cantico Bowler Bag: I've blogged about this bag before, but I love it so much that it just seems to keep coming up! The classic shape and the dainty bow detail are too perfect. 5. Diptyque Do Son eau de parfum: This smells ah-mazing. It's possibly the best perfume I've ever come across, and I am obsessed. 6. Ray-Ban Aviators with pink lenses: This girly spin on a classic style is such a fun update.